Welcome to Puzzle Baron's Circuits! 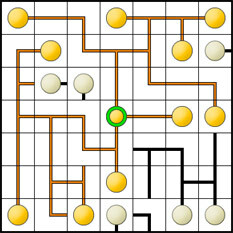 Whether you know them as network puzzles or circuit puzzles, we've got thousands of unique puzzles here for you to solve. You can play for fun, or register a free account and compete against other players for the Circuit Puzzle Hall of Fame! The puzzle grid consists of a series of differently-shaped wire segments, lightbulbs and a battery (the green circle, always in the center of the puzzle). An electrical charge will flow from the battery's terminals out through any wires that are directly connected to it. Your task is to rotate the pieces in the grid in such a way so that every piece of wire and every lightbulb is "electrified", without creating any loops. There is one, and only one, unique solution to each puzzle. All pieces, including the battery (green circle) in the center, can be rotated. Left-click or tap to rotate a piece clockwise, right-click to rotate it counter-clockwise. The puzzle will auto-submit once the correct solution have been uncovered. Every wire section and every lightbulb must be electrified. All ends of the circuit must terminate in a lightbulb. "Loops" are not allowed in the circuit. A "short circuit" spark will appear whenever a loop is detected. What is the 1st letter in arch?